This July 4th, America's national Independence Day celebration kicks off our country's 242nd birthday, as A Capitol Fourth on PBS welcomes back Emmy Award-nominated actor and producer John Stamos (Fuller House, Scream Queens) to host the festivities. Broadcast live on PBS from the West Lawn of the U.S. Capitol, this time-honored 38 year-tradition puts viewers front and center for America's biggest birthday party with the greatest display of fireworks anywhere in the nation lighting up the iconic D.C. skyline. The country's longest-running live national July 4 TV tradition will feature all-star musical performances by: multi-platinum selling music legend Jimmy Buffett with the Broadway cast of the new musical Escape to Margaritaville, making their first stop after Broadway at the U.S. Capitol before launching a national tour; "America's Band," the iconic multi-platinum selling music legends The Beach Boys; three-time Grammy Award-winning and multi-platinum selling artist Pentatonix; legendary Motown stars The Temptations; acclaimed multi-platinum country music singer-songwriter and winner of the iHeartRadio Music Award for Best New Country Artist Luke Combs; country music star and American Idol alum Lauren Alaina; 12-time Grammy Award-winner and gospel legend CeCe Winans; and internationally acclaimed Grammy award winning violinist Joshua Bell; with the National Symphony Orchestra under the direction of top pops conductor Jack Everly (additional performers to be announced). "You can't get more patriotic than this!" said Stamos. "I'm excited to carry on this July 4th TV tradition for the American people and especially proud to honor our veterans. You don't want to miss it!" As we come together as one family of Americans to celebrate our freedom and independence, the concert will pay special tribute to our men and women in uniform by world-renowned four-time Grammy Award-winning soprano superstar Renée Fleming, who will perform "You'll Never Walk Alone" to honor them. The inspiring moment will be dedicated to our troops serving around the world, their families, and all those who have made the ultimate sacrifice, fighting for our freedom. The concert will also feature a special tribute to The Beach Boys who will be honored for their extraordinary musical career as the fifth-ever recipients of A Capitol Fourth's National Artistic Achievement Award. Past honorees include Gloria Estefan, Stevie Wonder, Reba McEntire and John Williams. Stamos, a longtime Beach Boys friend and frequent collaborator will present the prestigious award to the group. 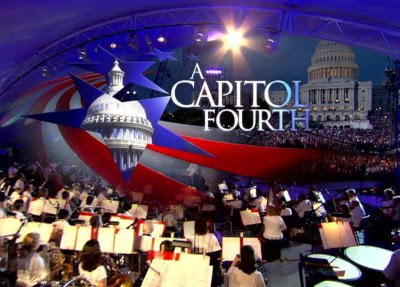 The 38th annual broadcast of A Capitol Fourth airs on PBS Wednesday, July 4, 2018 from 8:00 to 9:30 p.m. ET before a concert audience of hundreds of thousands, millions more at home, as well as to our troops serving around the world on the American Forces Network. The program can also be heard live in stereo over NPR member stations nationwide. The concert will also be live-streamed on PBS, You Tube, Facebook and PBS and available as Video on Demand for a limited time only, July 4 to July 18, 2018. The top-rated, award-winning program will be capped off with a rousing rendition of Tchaikovsky's "1812 Overture" complete with live cannon fire provided by the United States Army Presidential Salute Battery, an audience favorite and A Capitol Fourth tradition. Also participating in the event will be the Choral Arts Society of Washington, the U.S. Army Band "Pershing's Own," the U.S. Army Herald Trumpets, Members of the Armed Forces carrying the State and Territorial Flags and the Armed Forces Color Guard provided by the Military District of Washington, D.C. The program is a co-production of Michael Colbert of Capital Concerts and WETA, Washington, D.C. Executive producer Michael Colbert has assembled an award-winning production team that features the top Hollywood talent behind some of television's most prestigious entertainment shows including the Grammy Awards, The CMA's, the Tony Awards, Saturday Night Live, and more.